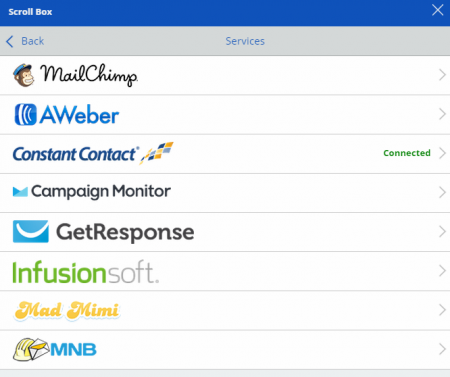 Boost Email Subscribers and Social Sharing! SumoMe addresses both of these issues in a slick and affordable way. I’ve been testing SumoMe’s apps for the past few weeks and the results? Rewarding. Free to use, the SumoMe store includes some key functionality for blogs, business sites and more, though you’ll be happy to pay $10 to the developers. The Smart Bar displays at the very top of the webpage as a horizontal bar with a minimum height. It’s a non-intrusive way to ask visitors to subscribe. The Scroll Box appears elsewhere on the screen during the visit – such as sliding in to the bottom right of the page – and you can write you’re own lead-in so you can use trigger words to encourage more signups. List Builder displays a lightbox popover for collecting email addresses. Its smart mode tries to determine when someone plans to leave the site and attempts to grab their attention. Subscribers, by the way, are added directly to the database if you’re using one of the supported providers. Otherwise, you can download a CSV file and import them into your email marketing software. Don’t let the simple settings fool you. The functionality is robust. See what visitors are clicking on. The Heat Maps app shows you which links get clicked the most. This is useful when trying to determine what navigation elements work and which ones are bombs. SumoMe’s Sharer is clean and fast. It hugs the edge of the window nicely and provides an overall share count. The Sharer app displays social sharing icons in a beautiful way. A downside to Sharer? It only supports 16 services. However, many users of niche social sites are used to having to click a “more” button to find their service, and many instead use a browser extension to share from any site. When the screen size drops down to that of a mobile device? The sharer bar collapses into an arrow (bottom left), which launches a menu of sharing icons. The Image Sharer app overlays social sharing icons on your non-linked images. This tool currently supports image sharing to Pinterest, Twitter and Facebook. Along with the post is a link back to the source. I love this tool, but I’d like to see a few more networks added. I’d also like to control which images can be shared by use of tagging. Navigational images needn’t be included. Prompt sharing of quotes or specific lines of content. The Highlighter app allows visitors to select text and then immediately tweet or post the content, along with a link to the source. 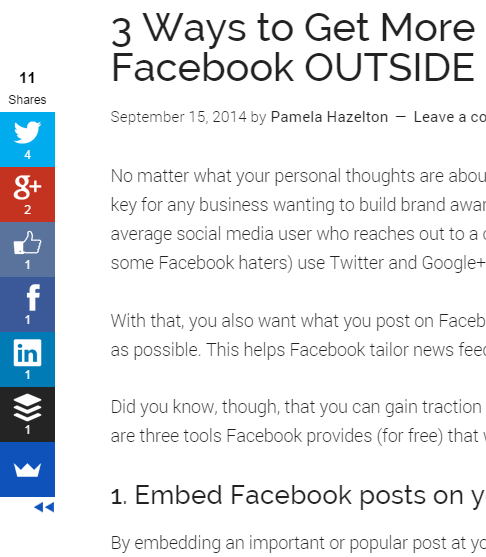 Once the content has been highlighted once, it stays highlighted for others to also share. I love the concept, but I’d love it more if I could control the highlight color. I’d rather only the star and count be displayed. 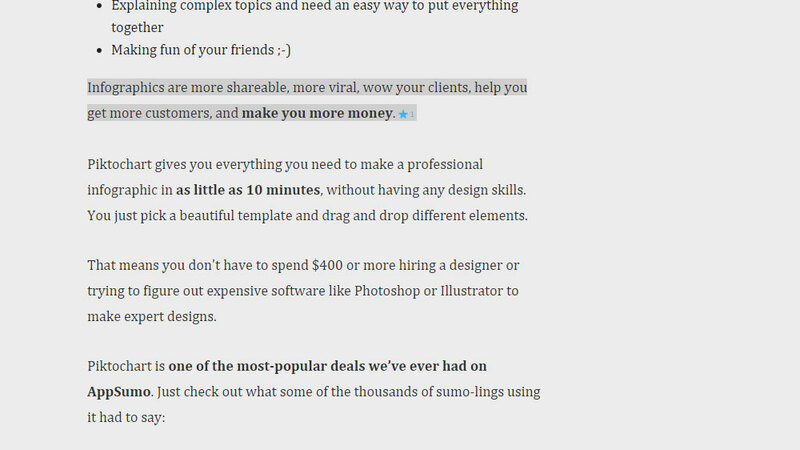 This, however, is a design issue for me; if your visitors aren’t thrown by the gray highlighting (try it and ask them!) this tool can help boost social visibility. Offer incentives to grow your email list. The Leads app is a trial, and it allows you to provide downloadable content in exchange for a signup. If you don’t have content already created, Leads has a simple tool that will generate a downloadable PDF based on the content you enter. Note that this is bare-bones in overall styling, so ideally you’ll want to follow existing design forms and create your own. You can also direct users to a specific URL. The bonus? Lead provides instant download to subscribers. The trial isn’t based on time. It is for 100 leads! After that, you’ll need to pay $100 annually to use this app. That’s an awesome price for total automation. You’d be shocked at how easy it is to install SumoMe. It’s done by pasting one script between the head tags of the website. WordPress users could opt to install a plugin. The time for installing and configuring each app is but a few minutes, and they can be turned off quickly if you find a problem. When you first use SumoMe you’ll notice a small, blue vertical bar on your website. This is used to access all the components of the apps. That’s where $10 comes in. Pay it once and that bar is hidden from everyone else. The blue vertical line on the edge of the browser? That can be turned off for a one time fee of $10. I quickly paid my $10, a ridiculously low price for a growth strategy. I imagine the real money comes from Leads. At just $8.33 a month, though, I can’t imagine why anyone wouldn’t find value in its functionality. There isn’t a single website I’ve worked on or visited that could not benefit by using one or more of the tools available via SumoMe. An email list-building tool is a must for any business, as is a social sharer. Image Sharer would work well on DIY sites and online stores (though I still say it should be restricted to specific images), and Leads is a great way for any type of business to offer some kind of content as a bonus to subscribers. Which of these apps do you think will benefit your website? 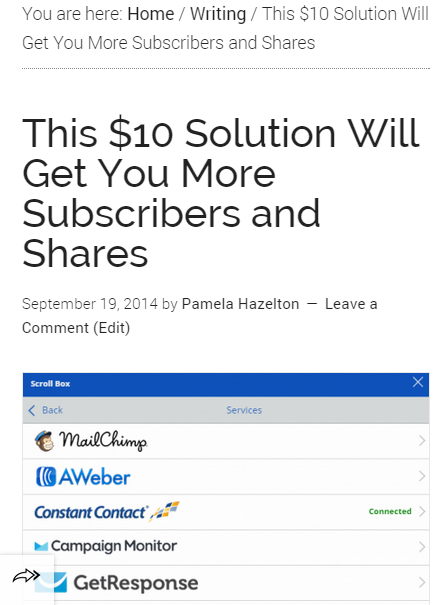 Are you using these or any related tools to boost subscriber count and conversions? Chime in below! Disclaimer: I received no incentive to write this post. In fact, SumoMe was not aware I wrote it until just hours before it was published, and no requests for alterations were made.